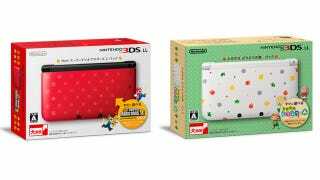 Nintendo just announced two new versions of the 3DS XL handheld, both currently slated for release in Japan only. Which is deeply upsetting, because they're amazing. First up, this custom Animal Crossing 3DS XL, which will ship with the game when it's released in Japan on November 8. Next, this New Super Mario Bros. 2 3DS XL, which is out a week later on November 15. My god, they're gorgeous. Both handhelds obviously ship with copies of their respective games, though note they'll be downloadable versions, not cartridges.